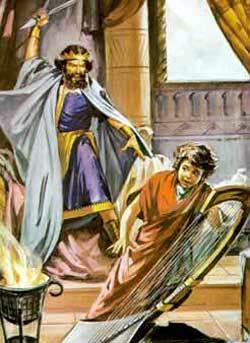 Saul throws his spear at David. WHEN SAUL ANDDavid, and the whole army were coming home in triumph, after the defeat of the Philistines, the women of Israel, as they passed along, came out of all their cities to meet them with dances and songs of joy. And as they danced and played on instruments of music, they said, “Saul has slain his thousands, but David his ten thousands! And Saul was so much displeased at their thus giving more honor to David than they did to their king, that from that day he began to regard him with jealousy and distrust. From the time that he had so sinned against God as to cause Him to give the kingdom of Israel after his death to another, Saul had become liable to fits of sadness and severe gloom. God had withdrawn His Spirit from him, and he was miserable–almost mad. His servants, who were anxious to comfort him, thought that music would soothe the distressed mind of the king, and, as David played skillfully upon the harp, they would have him play before Saul. And, whenever he did so, Saul was refreshed, and became cheerful again. But after he had grown envious of David’s renown, twice, when David was playing before him, he threw a spear at him to kill him. David, however, escaped unhurt. Saul then tried in various ways to destroy him by means of his enemies the Philistines, setting him on duties that seemed as if they must cost him his life. Still God preserved David alike from the Philistines, and from Saul’s own servant, whom the wicked king had commanded to put him to death. Then Jonathan, Saul’s son, having sent David, whom he loved, to a place of safety, pleaded with his father for him, reminding Saul how faithful David had been to him, and what good service he had done the kingdom by killing the Philistine who had so frightened them all. And Saul yielded to the pleading of his son, and promised that he would do David no harm. So he was brought back, and served Saul as before. War, however, soon broke out again between the Israelites and the Philistines, and David again defeated them with great slaughter. This roused all Saul’s ill-will against him; so that, when in one of his fits of gloom, David, as was his custom, was trying to cheer him with his harp, Saul rose and threw a spear at him with such force that, as David slipped aside, it stuck fast in the wall. That night David made his escape and never returned.